BATON ROUGE — Leading Democratic legislators from Baton Rouge gathered Tuesday across the street from the Baton Rouge General Hospital’s Mid-City location to highlight the Jindal Administration’s hypocrisy and call for the governor to accept Medicaid expansion dollars and protect Louisiana hospitals. Last week, the hospital announced that pressure from uninsured patients would force it to close the Mid-City emergency room. The Jindal Administration responded by claiming it found $18 million to keep the ER open. Sen. Karen Carter Peterson, chairwoman of the Louisiana Democratic Party, also pointed out that Congressman Bill Cassidy has yet to say a public word about the emergency room crisis in his own district. Sen. Sharon Weston Broome, D-Baton Rouge, reminded voters that accepting Medicaid expansion dollars would help fund all state hospitals. “We are continuing to fight because more than 240,000 Louisianians don’t have health coverage because they make too much for Medicaid and not enough for subsidies. They have fallen into what we call the Jindal Gap,” Broome said. 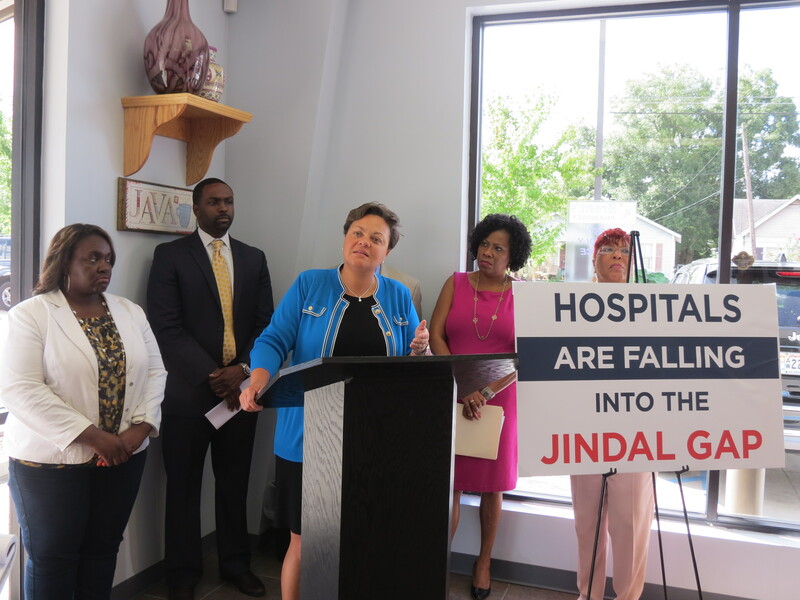 “Now it appears our hospitals are starting to fall into the Jindal Gap, too,” Broome said. “Many months ago Democrats stood in this very spot and warned of the consequences if Louisiana did not accept the Medicaid dollars. We warned that hospitals like Baton Rouge General’s Mid-City Campus were in danger,” Broome said. “It’s important to remember that when a hospital closes in your community, it doesn’t just close for uninsured people. It closes for everyone. Everyone should care about what’s happening at Baton Rouge General because it could be coming to your community in the very near future,” said Rep. Alfred Williams, D-Baton Rouge. “As we stand here today, the governor’s hospital privatization deals are still in limbo. Earlier this year the federal government rejected the Jindal Administration’s proposal. This was something that we all warned could happen,” said Rep. Patricia Smith, D-Baton Rouge. “The hospital privatization scheme by the Jindal Administration has been nothing short of a disaster. But there is a way forward. In states that have accepted the Medicaid Expansion dollars, hospitals are thriving. In states that have not, hospitals are closing,” Smith said. “This fiasco is far from over. The Jindal Administration claimed to have magically found $18 million to keep open Baton Rouge General’s Mid-City emergency room but they won’t tell us where the dollars are coming from,” Rep. Ted James, D-Baton Rouge. “I submit to you that they don’t know,” James said. “Keep in mind that last year’s budget was $24 million out of balance. The Jindal Administration had to borrow money from this year’s budget to close out last year’s budget,” James said. James also pointed out that projections show a $1.2 billion shortfall for next year’s budget. “Medicaid expansion could alleviate the problems that we face today. Those are our tax dollars that are going to other states. We want those tax dollars to come to Louisiana to care for our people,” said Rep. Regina Barrow, D-Baton Rouge. “Silence speaks volumes. Bill Cassidy is the congressman from this district. This hospital is in his district. He holds himself out as a doctor who cares about people. Where is Bill Cassidy today? He has been silent,” said Sen. Karen Carter Peterson, D-New Orleans.